The Palace of Gaviria has opened this week an exhibition that brings together 180 works by some of the most iconic artists of the 20th century. It is a small part of the private collection of Arturo Schwarz, who donated more than 700 pieces to the Museum of Israel. The history of this collection is intimately connected to the life of its owner. 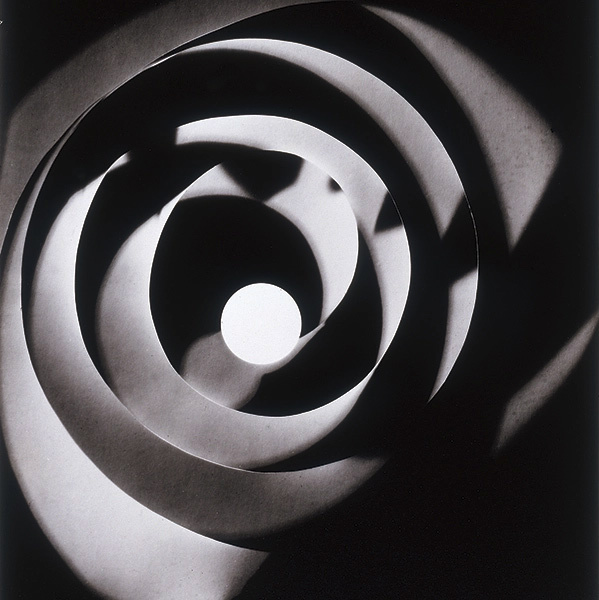 Schwarz specialised in works of Dadaism and Surrealism, artistic movements in which he became a close friend with some of its greatest exponents, such as Duchamp, Man Ray or Breton. This obstinacy for Surrealism began in the mid-40s, after reading the "Manifesto" by André Breton, which led him also to join the movement. Later, in 1945, he met Marcel Duchamp, with whom he had a relationship since then. In his own words, he was fascinated by being in contact with artists who were "extremely free and intellectually honest". He worked as a writer, curator and gallery owner, but he is best known as a collector. This passion for twentieth-century art, and particularly for these two isms, has guided his eagerness to gather representative works of those who were his friends, to the point to treasure a set of pieces that travelled several times around the world. Most of this collection was donated to the Museum of Israel to form the "The Vera and Arturo Schwarz Collection of Dada and Surrealist Art". The process began in 1972 with the transfer of 30 replicas of Duchamp's readymades, followed by the extensive Dada and Surrealism library in 1991. Finally, in 1998, on the occasion of the 50th anniversary of the museum, the rest of the legacy was completed to become a permanent fund in the museum. 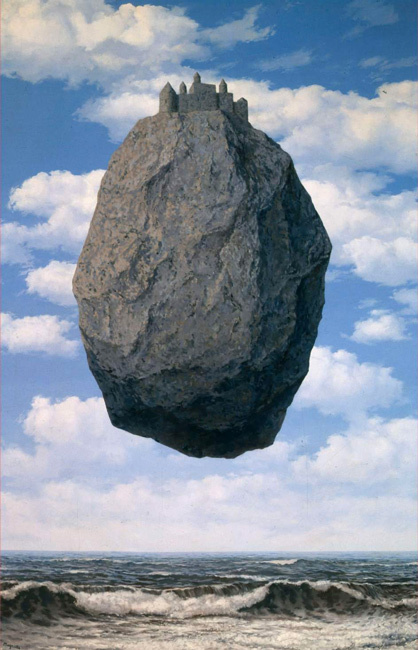 Under the claim of Duchamp, Magritte and Dalí, the Palace of Gaviria brings together a selection of the most emblematic works of these isms of the last century, which are joined by Ernst, Tanguy, Man Ray, Picabia, Calder, Schwitters, Höch, Blumenfeld, Janco, among others. These artistic movements were a response of the creators to the convulsive times lived in old Europe devastated by the warlike conflicts and the lack of social integration. The rereading of the tangible, the dream interpretation, the scape to a different reality were ideas that fed the creative impulse of these artists, true architects of the critical thinking of the 20th century. 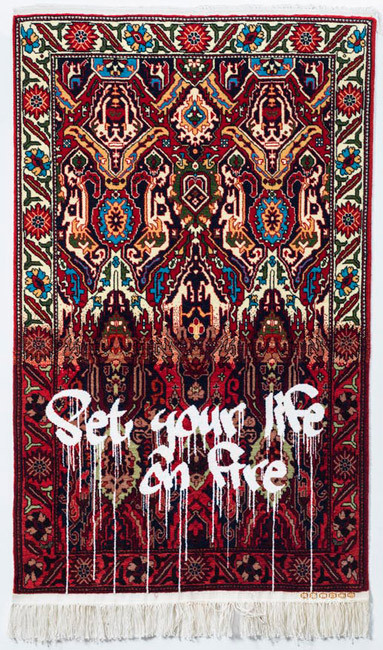 Faig Ahmed (Azerbaijan, 1982) is a tireless creator whose work rescues one of the main cultural signs of this region of the world, famous, like other surrounding countries, for its majestic carpets, a tradition that goes back several millennia ago as a sign of their collective identity to become a world reference. Their hypnotic drawings of symmetrical composition, which sometimes resemble elements seen through a kaleidoscope, unfold in layers woven of bright colours with enormous visual impact. This practice synthesises the entire history of the Persian people until it becomes a cultural symbol that conveys a large knowledge accumulated over the centuries. This task has traditionally been attributed to women, who follow patterns of colour and composition to give the perfect finish we all know. 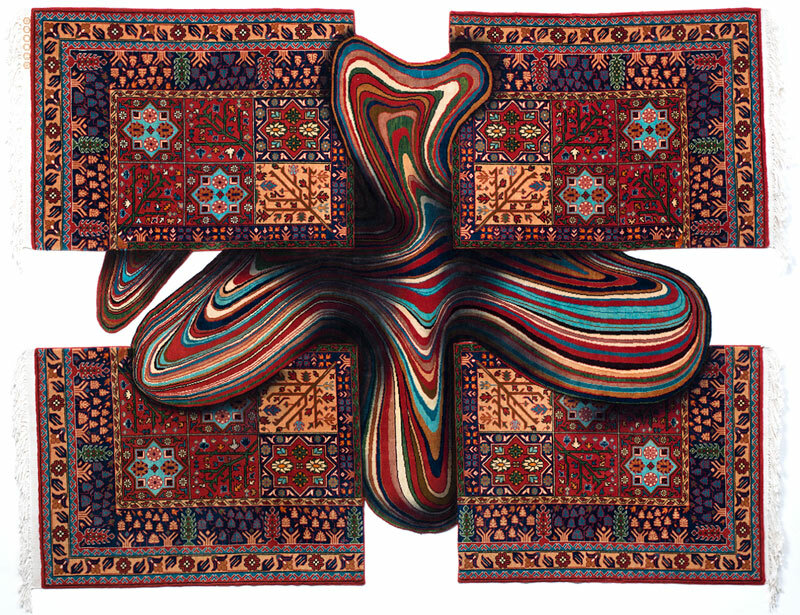 The work of Faig Ahmed is a tribute to this meticulous and invisible work and offer a rereading that has bridges with the past. 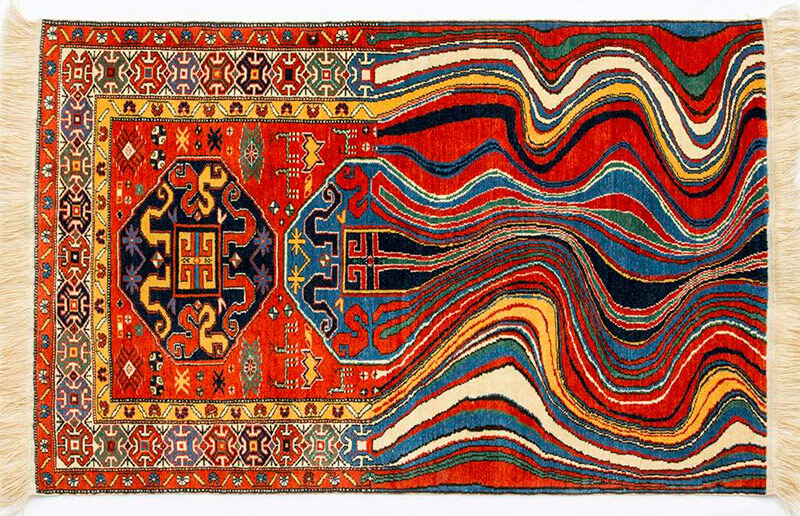 The artist graduated in Fine Arts in Baku specialising in sculpture, and, although his production is very diverse, he has become famous for his work with carpets, a type of pieces with which he was presented in the Azerbaijan pavilion of the biennial of Venice in 2007. Today, he is part of important collections and museums around the world. As he explains, the goal is to channel conceptual art, with a strong base of colourist abstraction, through traditional techniques, far from what is usual in the field of visual arts. In his opinion, it is essential to look at the past to find that mystical and spiritual connection that deals with the passage of time and our location at the moment of history. 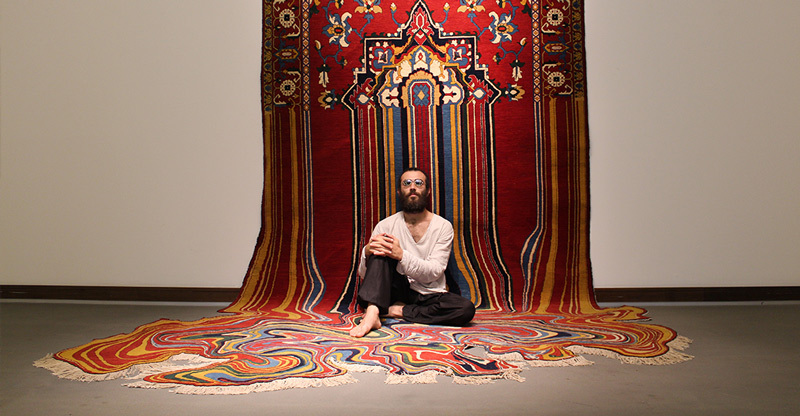 His work raises an open question about what is true and what is not, what should be, what we really see, and how much we owe to our cultural heritage to be where we are today. The result is an eclectic work, which mixes disciplines and techniques, in large projects on which he previously works on a computer. A task of decomposition and deconstruction that he carries out with great inspiration to give rise to something completely new and fascinating.